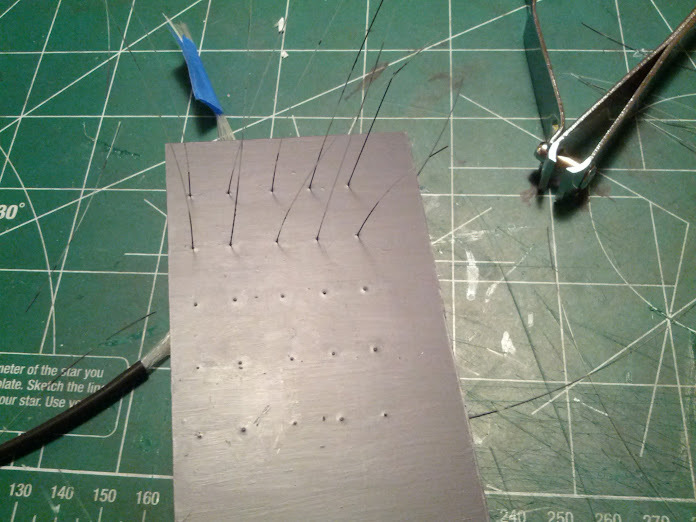 This will be my first starship build to include fiber optic lighting. I ran across an article somewhere on the web about this and they recommended .265 diameter fiber and a #84 drill bit. 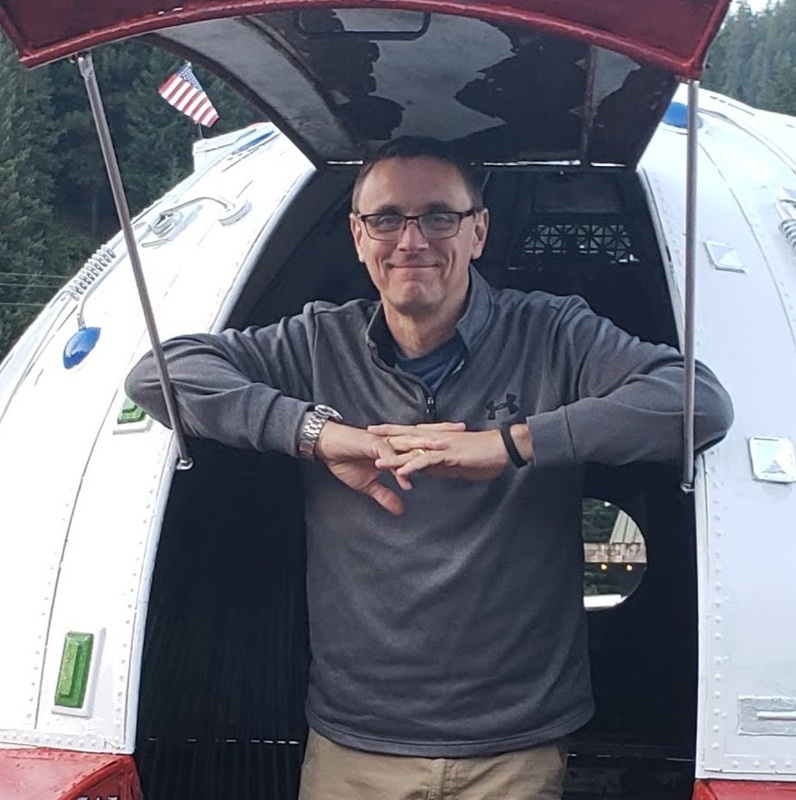 So I ordered these things and they turned out to be far too small for my ship’s scale. What I really needed was about 1 mm diameter fiber. So I reordered the correct bits and fiber but that left me with some extra thin fiber laying around. I found a use for it pretty quickly. My duel landing bays needed some landing lights and so I set about drilling and threading them up on the landing bay deck. 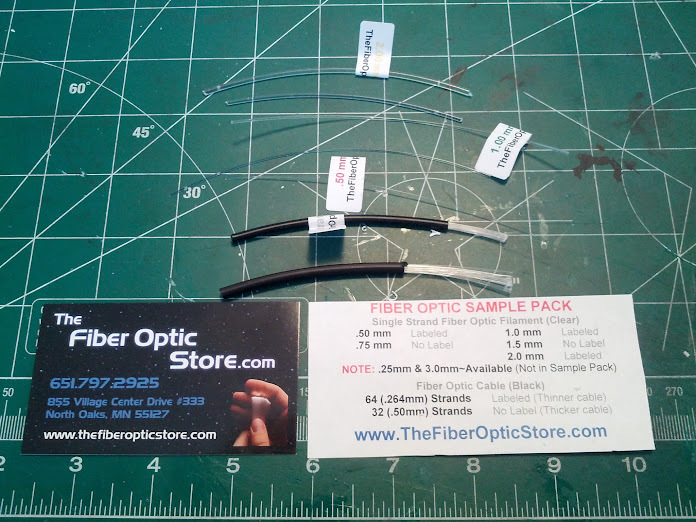 This is the sample pack that The Fiber Optic Store sent me and it allowed me to decide on the proper diameter for my model. 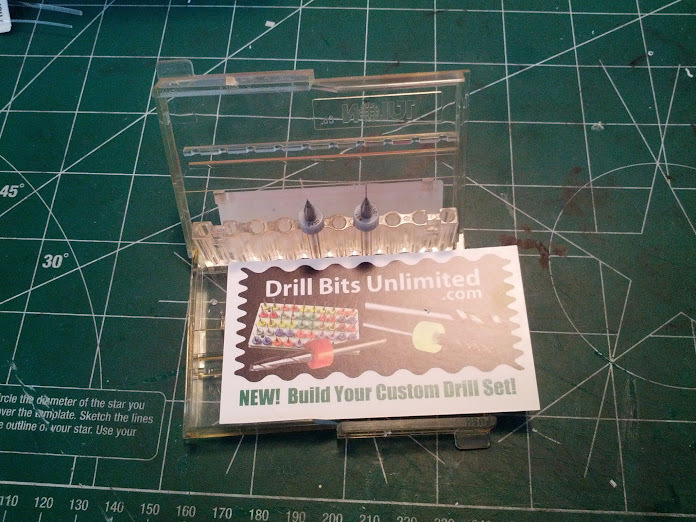 I purchased my #84 bits from Drill Bits Unlimited and they came in this handy case to keep them safe. I’ve already broken one of them off, good thing I got two. Here we see the bundle of fiber being glued into the underside of the landing bay deck, which was raised to account for the fibers. 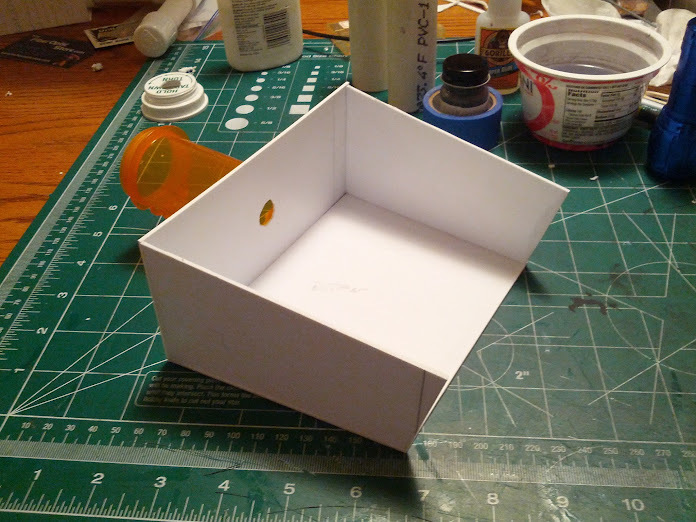 I used Elmer’s white glue to secure them. 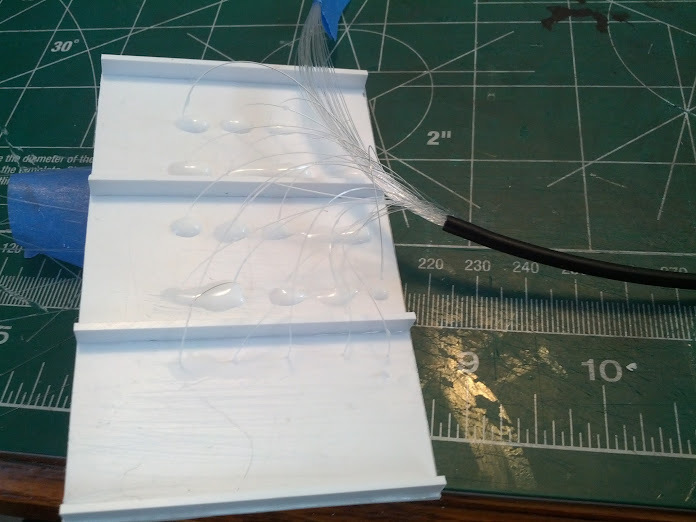 This works, but is not ideal and the fibers can easily be pulled out. Here’s the finished deck with glue drying. Notice I taped things down to prevent wiggle. The next step was to paint the deck. The fibers stick out a few inches on the other side. After I painted the deck, I used nail clippers to trim off the fiber. Here I am clipping fibers on the painted deck. The finished fibers are perfectly scaled for deck lights. I learned that the bundled fibers are perhaps not the best solution. 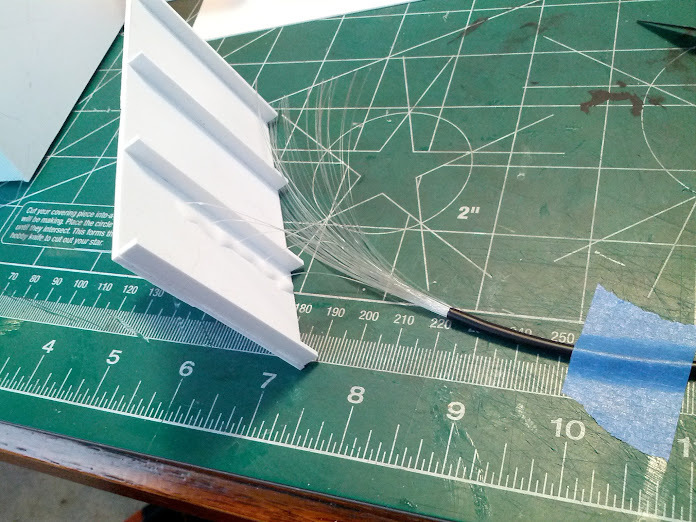 When I use the larger fibers for the portholes, I will bundle my loose fibers myself with shrink tube or tape. 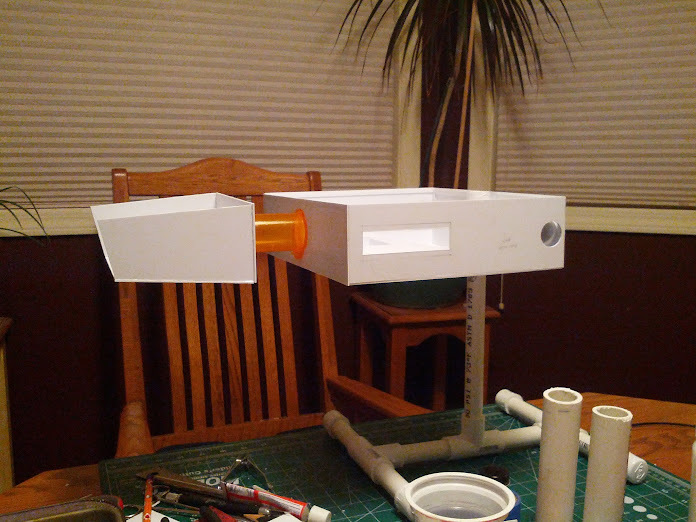 I started framing the head of the starship, using the pill bottle as the neck. I later secured it to the head with tiny screws. The bottle slides into the body and is secured with the screw top. I love it when a plan comes together like that. Here is the head mounted to the body. That’s all I’ve done in the past week or so. 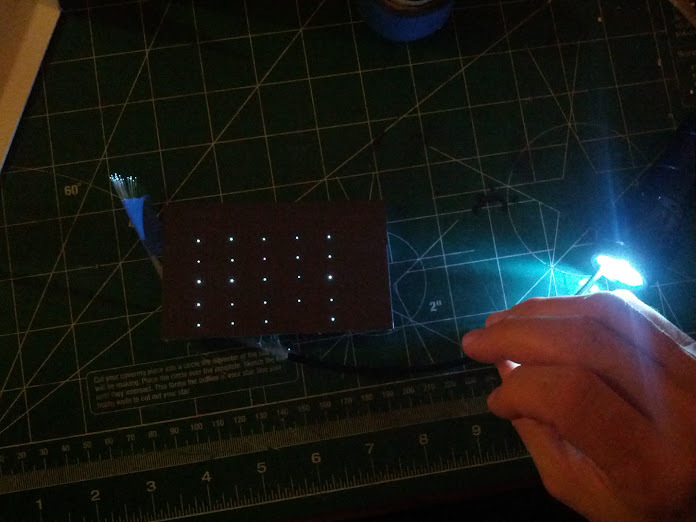 I should get in my new fiber optics and bits this week, so I can start mapping out where the portholes will go. I also need to start building up the engines. To this point: 8 hours of work.